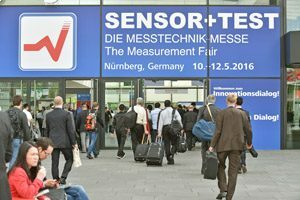 Sensor+Test 2017, the international trade show for sensing, measuring and testing technology, was held from May 30-June 1, 2017 in Nürnberg, Germany. 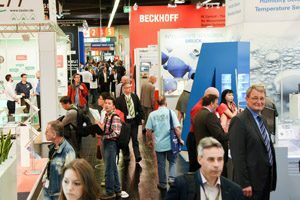 This year’s show attracted over 8,100 attendees, 27% from outside Germany, who were able to discover the latest offerings from 568 exhibitors. Thirty-seven percent of the Exhibitors traveled from other countries to demonstrate their products and capabilities. The theme for this year’s show was “Welcome to the Innovation Dialog”, focusing on intelligent, networked solutions for the requirements of Industry 4.0. These objectives include: more efficiency, productivity, security, and quality. For this to succeed, the operating data of machines, systems, and processes must be acquired and analyzed quickly, comprehensively, and accurately. A special topic, “Networked Measuring for Mobile Applications” was especially well-received by conference attendees. The range of products and services covered mobile systems for measurement on humans to instrumented vehicles, mobile machines, and aerospace technologies. Holger Bödeker, Managing Director of AMA Service organizers expects to see growth in all key figures and a very attractive program for Sensor+Test 2018, thanks to a renewed cooperation with the European Test and Telemetry Conference. The conference will include the special topic “Sensors and Measuring Technology in the Industrial Internet,” selected by the Exhibitors’ Committee for 2018. The 2018 show will be held from June 26-28, 2018, in Nürnberg.